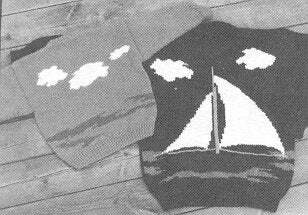 THE SAILBOAT #128 child & 129 adult eweCanknit knitting pattern for child's sizes 2-8. Uses worsted weight yarn. Chest measurements 2[22 ins] 4[25 1/2 in. ], 6[25 1/2 ins] 8[27 1/2 ins.]. Finished chest sizes; 26-28-30-32 inches. Adult sizes S-XL uses bulky/chunky yarn. Finished measurements 40-52 inches. Designs on front and back. Graphs are used for the designs. More than one pattern can be shipped for the same postage. Any excess postage will be refunded.